I was wondering what we consider to be the better things in life? For most, the list would contain material things – lots of money and lots of things that money can buy! 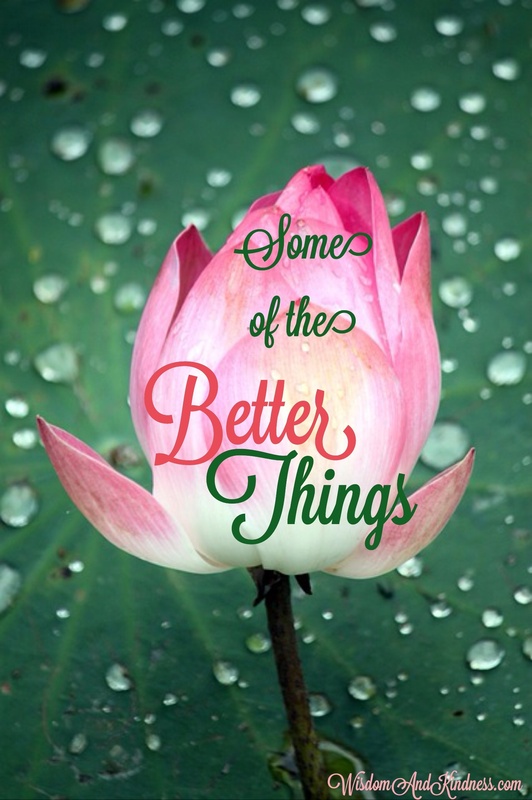 So, what are the better things? A life with God … walking in wisdom and understanding … living in righteousness and integrity … having love and humility … in a home with peace and harmony. Yes, Lord, I am persuaded that these are the better things. Quite to my surprise, I was asked to give a testimony of a virtuous woman. First, I would like to say how very unqualified I feel to be called upon to undertake such a venture. I am convinced that a true virtuous woman would never stand to sing her own praises. A true virtuous woman knows well the struggles of this life as she attempts to walk in righteousness, and because she knows how often she falls so desperately short, she could never claim such a title for herself. No, this would be something that I would be unable to do. Then, can you imagine my surprise when my husband leaned over in a church service where the focus was on this type of woman and said: You are exactly that kind of woman. I, then, understood something more of this virtuous woman. Indeed, she didn’t make that claim for herself. Proverbs 31:28 says that her children rise up and call her blessed; her husband also, and he praises her. So it matters not what I may say about myself. The real question is what does my husband say? And, what do my grown children say? I suppose the realization of the qualities that this woman possesses comes more in looking back in reflection over time, rather than at one specific moment in time. It is the consistency, the steadfastness, and the faithfulness that has been repeatedly seen through the years more than what someone sees just today, that causes one to stand and praise his wife or mother as a virtuous woman. So, where does it all begin – being a virtuous woman? The beginning place is always with God. And this, too, was the beginning place with me. I had to realize Who He is – the Almighty God, Creator of all things, holy and righteous beyond our understanding, but so loving and merciful that He would come to this earth, be born into the body of a human being, willingly suffer and die, taking the sins of humanity – including mine – in His own body to save fallen man and reconcile them to Holy God. What a God! With this personal understanding of God, an additional thing took place in my life. Perhaps it can best be explained by a verse found in 2 Corinthians 8:5. There we find a phrase that says that they first gave their own selves to The Lord and to us by the will of God. My life had been given to The Lord. I no longer belonged to myself; I now belonged to the living God. My life was no longer my own; it now belonged to The Lord Jesus Christ. But the verse continues to say that they gave themselves to us by the will of God. And that is where the focus of my life changed. My life was the Lord’s and was to be spent for others. The others that surrounded my life, first and foremost, were my family. The Lord, by His grace, began to show me, step by step, and day by day,ways that I could serve them – ways that I could encourage them – ways that I could comfort them. But in the day to day experiences of life, I found that I would tire as I served The Lord by serving others. However, because I had given my life to The Lord, I now found that my strength came from Him – a strength far surpassing anything that I had known. Scripture says that the virtuous woman is a strong woman. She girds her loins with strength, and strengtheneth her arms. And strength and honor are her clothing. It was to The Lord that I would continually turn to find this ever-present help and strength from day to day. I knew that The Lord was my strength, and I could make no claim of possessing it myself. The Lord also gave me great contentment in being a wife and mother, laboring in unseen ways. He taught me that a virtuous woman does not seek recognition of her own. She seeks to honor her husband and delights in him being known in the gates. I knew, in my heart, that was what my life was to be about – exalting my husband – serving him and my children. How did I maintain this attitude? Once again, it is The Lord. He has taught me that His ways are right and good; I must deny myself, and I must not strive for my own ways. He faithfully reminds me that my life is not about myself. It is about Him – it is about His righteousness – it is about His holiness – it is about His glory. I would slowly get a glimpse of this truth – that I must, above all else, reverence Him and His Word. I must seek to do those things which were pleasing to Him. Living just one day at a time, serving The Lord and serving those around me turned into weeks, months, and years of serving The Lord. Then, amazingly, those years turned into a lifetime of serving Him. Please don’t think for a moment that these things were easy. How many times I struggled with myself. How many times I failed miserably in that which The Lord had called me to do. It seems, however, as The Lord forgives all of those failures, He also erases them from the minds of our husbands and children. We may remember them regretfully, but are humbled and amazed as we hear our children rise up and call us blessed and our husbands praise us. And lest you think I could never become a virtuous woman I would like to encourage you. It comes little by little, day by day, so often in the simple ways. It occurs when you do your husband good day after day. It occurs when you take time to listen to your children. It occurs when you care for them day after day, when no one stops to thank you. It occurs when you cook, clean, and do laundry for your family, repeating the same tasks time and again. It occurs when you continue working at these things when you would rather quit and take a nap. It occurs when you reach out to help others that you see in need. It occurs when you speak truth to those around you because you truly care. It occurs when you look well into the ways of your household, refusing to neglect your calling. And it occurs when you do these things day after day, year after year, because these things please your Lord. Who can find a virtuous woman? Give your life first to The Lord, and then to those around you. You may find, in time to come, that this virtuous woman is you! I stood at the washer transferring the same damp clothes to the dryer as I had done last week. I loaded another load of clothes into the washer – the same clothes that I had loaded last week, then gathered up those that needed to be folded and put away – again the same clothes that I had folded and put away last week. The cycle continued week after week. I had come to the conclusion that this was a non-ending job. I was sure that my family purposed to fill up the laundry basket at any rare moment that they found that it may be empty. But I gathered up those clothes and brought them to the place where I sit to fold clothes. As I continued folding clothes, I reflected on this continual laundry task that I faced weekly, and the drudgery of it all. From there my mind wandered to another task, that of fixing meals. Oh, I thought, cooking is not just a weekly task. That one occurs over and over, over and over, over and over each day. Sometimes that one feels like a fast-running treadmill on which I can’t keep up. Sometimes I have even thought – Mealtime again! It seems as if we just did that! They can’t be hungry again! I’m sure most wives and moms have had those or similar thoughts at some time during their life. But I recall when The Lord freed me from this drudgery. Don’t misunderstand. I still do laundry weekly and still prepare meals, just as often as before, but what he freed me from was the drudgery of it all. What I learned was that my thinking was totally wrong! I needed to see laundry and meals through the truth of God’s Word. Laundry and meals in the Bible? There is nothing “spiritual” about that! But that is exactly where I was wrong! In a passage in 1 Timothy 6:6-8, the Scripture mentions contentment. Then the Scripture says: And having food and raiment let us therewith be content. What I saw through that Scripture was that food and clothing are the most basic needs that every person has. Almost all other material things are optional, but food and clothing are necessities. Now I will agree that most Americans have far more food and clothing than needed, but nonetheless food and clothing are basic human needs. Then, I saw my family through that truth. The most basic physical needs that my family had was food and clothing. And I had been given the privilege of meeting that need for them. For me, that was certainly a new way of looking at laundry and meals. My mind went from there to the virtuous woman of Proverbs 31, a woman who is familiar to us all. I went through the Proverb, verse by verse, and was amazed at how much time this woman spent taking care of the food and clothing needs of her family. At that moment, I saw the virtuous woman in a whole new way. I knew the Scriptures described her as a woman strong in The Lord, as a woman who did good to her husband, as a woman to be honored, but what I now realized was that she spent most of her time caring for her family, and very much of that time was spent on the food and clothing needs of her family. 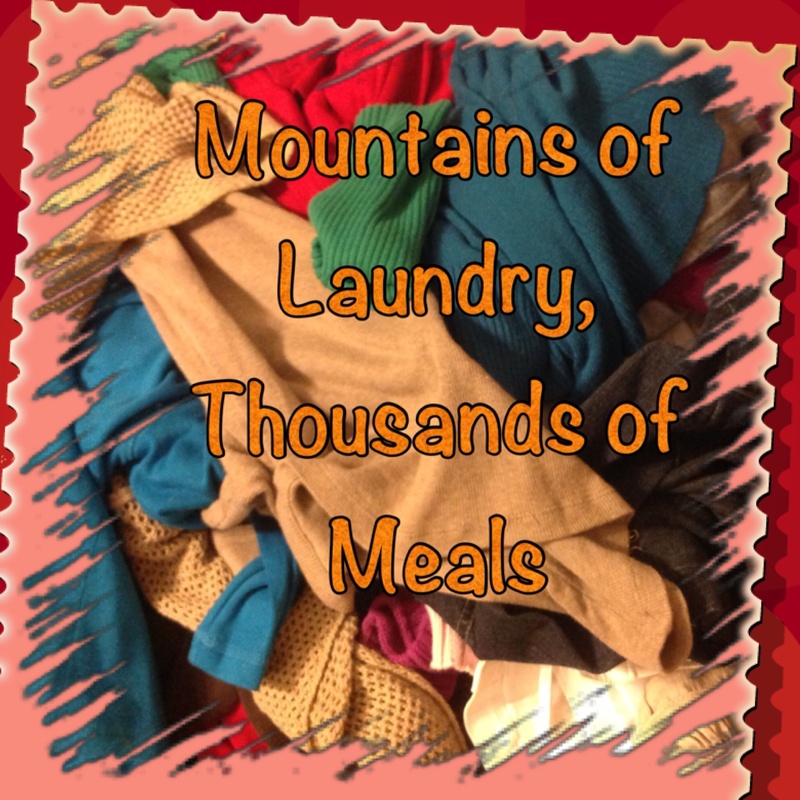 In all of my life, I had never seen laundry and meals as part of my serving The Lord. I had certainly never seen it as a “spiritual” work. That was the day that The Lord took the drudgery out of my housework. I realized that all of those duties were not just responsibilities or obligations to be drudged through. They were actually a large portion of my service to The Lord. I began to see our home as a place of refuge for us all – a place where physical, emotional, and spiritual needs would be met. My outlook changed. My attitude changed. Actually, it was my heart that changed. I still have mountains of laundry to do and thousands of meals to prepare, and I still need to be reminded. But this is what I now know – each load of laundry and each meal that I prepare is one more opportunity to serve my Lord by loving and serving my family. 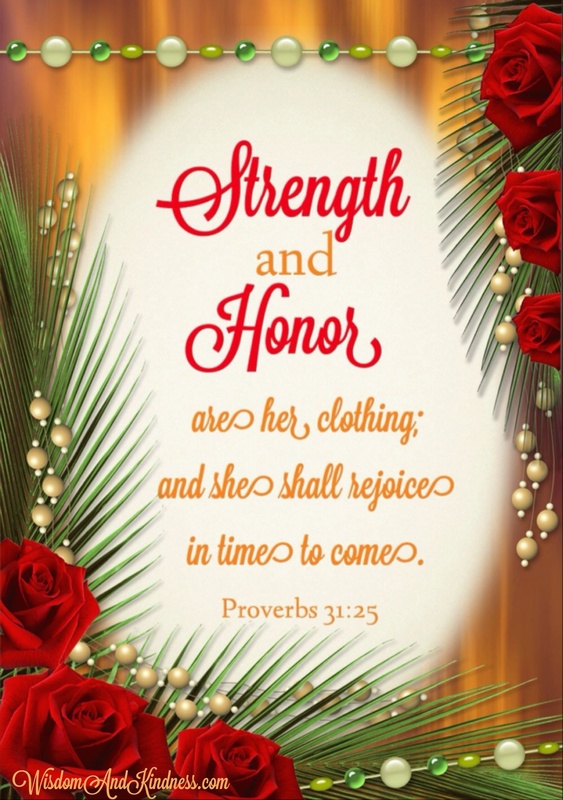 And when the drudgery tries to sneak back in, and surely it does, I ask The Lord to remind me – these are the things that a woman that is strong in The Lord does – and she will be praised. … She worketh willingly with her hands. Isn’t it amazing the powerful impact that one word in the Scriptures can have? As the virtuous woman is described in Proverbs 31, Scripture could have simply said that she works with her hands. But there is a very important word inserted in this passage – and that word is willingly. She worketh willingly with her hands. We instantly get the picture of the virtuous woman’s heart. The work that she does is not just an external action. It initiates and results from a willing heart. How different any work is when it is done willingly, rather than out of duty or obligation. The end result may appear the same when the work is accomplished, but the journey along the way will be, oh, so very different. The willing heart joys in the journey. The obligated heart loses the joy. A similar Scripture is found in 1 Peter 4:9: Use hospitality one to another without grudging. There is to be a love and outreaching to others, seeking to serve their needs, but look at the remainder of the verse – without grudging. You see, right actions could be taken to minister to others, but what was the condition of the heart? Was this a willing service – or was it done with grudging? The Greek word for grudging is gongusmos and is described as a private complaining. Perhaps the most private place of all that we complain is in our own heart. It is that murmuring that we do – perhaps to others, perhaps to our own selves – that directly affects the way that we serve. A full reading of the Proverbs 31 woman reveals no murmuring and no complaining, but rather a willing heart. She worketh willingly with her hands. But let’s look more closely at the word willingly. This word is far more than just saying, “OK, I’ll do that and I won’t complain!” The most common translation of this word is to take pleasure in; to delight in. In fact, a full study of the word will show that Proverbs 31 is the only place that the word is translated as willingly. It is most frequently translated as desire, delight, and pleasure. So it is very appropriate to say that the virtuous woman desires her work, delights in her work, and takes pleasure in her work. Isn’t that an interesting view of her heart! And in what kind of work was she delighting? She was delighting in caring for her family. She was taking pleasure in doing good to her husband. She was delighting in looking well into the ways of her household. She was taking pleasure in seeing that they were fed well and clothed well. She was delighting in reaching out to those in need. No wonder she is described as such a strong woman! Her life is not about herself. It is about her Lord, and it is about others. And she delights in it! Lord, we humbly ask that you renew our hearts, that they may be willing hearts – hearts that take pleasure in You and hearts that delight in serving You – hearts that work willingly – hearts that delight in serving our families and hearts that take pleasure in serving those in need. The above post was first printed in Dawning Light © 2003. Our aim … our goal … for our homes to be filled with Jesus. For our homes to manifest the fruit of the Spirit. 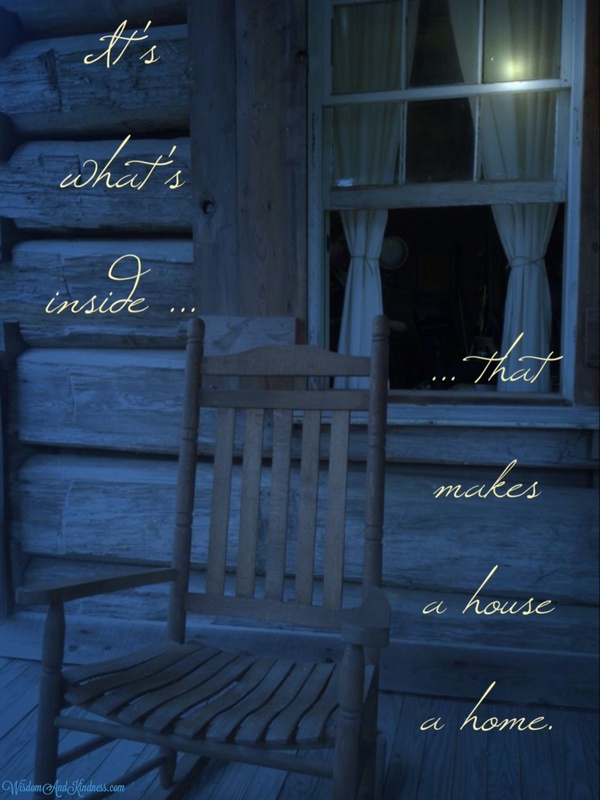 It is what is inside the home that counts. Is my home filled with love? Is my home filled with joy? Is my home filled with peace? Can patience be found in my home? Can gentleness be found in my home? Is my home filled with goodness? Can faith be found in my home? Is my home filled with meekness? And is my home filled with self-control? I know The Lord desires this fruit to be in my heart. And I know that He desires for it to be in my home. How will this fruit be found in my home? Surely, it must come through me!